QTEK Single Splice Tape and QTEK Double Splice Tape guarantee precise and secure connections of component reels used in pick and place machines. To avoid unnecessary machine stoppages, QTEK Splice Tapes provide precise attachment of the end of one component reel to the beginning of another. The cover tape is securely joined and can be peeled off continuously across the joint. The QTEK Tape Splice Clip consists of a brass shim with holes, and is used in conjunction with the QTEK Splicing Tool. The brass shim includes aligned holes, which allow the material to go through the sprocket wheel of a tape feeder, and points to firmly secure it to the tape carrier. QTEK Tape Splice Clips are supplied in boxes of 1,000 or 4,000 pieces and can be used with tape of any width. The QTEK Cover Tape Extenders add an extra 380mm to cover the tape of component reels, which avoids components being wasted or discarded when starting a new tape through a feeder. The QTEK Cover Tape Extender enables the use of tapes in full reels or short sections, without component loss. The strong adhesive bond between the original tape and extender piece ensures separation will not occur, even after a prolonged time under tension. The QTEK Splice Tool is a product specially designed and developed by QTEK for crimping and attaching splice clips. The QTEK Splice Tool is durable, ergonomic and easy to use, and is suitable for use with all QTEK Splicing Products. The QTEK Splice Scissors is an ingenious product, which uses locating pins attached to the side of the scissors to guarantee and accurate and aligned cutting of component reels each and every time. The QTEK Splice Station is a mobile unit, which encompasses all the products necessary to perform excellent splicing. The QTEK Splice Station incorporates a fixed QTEK Splice Tool secured to an ESD Safe trolley, as well as a QTEK Splice Scissors. 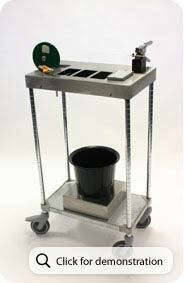 Unique features include an ESD waste bucket, and wheels with secure brakes for portability and safety, and four separate compartments to hold various splice tapes. The QTEK Splice Station is entirely ESD safe. Please note the QTEK Splice Scissors and Splice Tool are sold separately to the QTEK Splice Station. QTEK SMT Special Splice Tape is ideal for splicing new reels to old reels, for machines equipped with an intelligent feeder. Intelligent feeders contain a sensor, which record when, and what kind of component reel is loaded. Matt black tape is important for machine recognition and QTEK SMT Special Splice Tape is matt black in colour. It is proven to be both effective and reliable for use with Panasonic machines equipped with intelligent feeders.